Strawberry Crafts | Craft Projects, Tips and Tricks and More! Craft Projects, Tips and Tricks and More! So, you guys don’t really know much about the progress of my Afghan, mostly because the last time I posted anything about it, I had just bought the yarn and was still in the planning stages, having not actually sewn anything for it well. Since I’m only working with three colors and not their four, I had to amend their diagram and also, how many squares I was going to need. Overall, I figured out that I needed ten squares of each color, thirty total. Then I realized that I may not have enough skeins for my project, but I’m not entirely sure yet. Whether I do or not is not exactly a setback, but more annoying. I know that typically, you want to buy all the skeins you need so you get the right dye lot. However, while it may not look right in the end, I’m willing to accept that one black square is darker than the other one. I plan on stitching the squares together from right to left, doing one of each color in a five square width and a six square length. It’ll be a pretty good sized blanket overall, from what I believe. Nothing that’ll completely devour me when I wrap myself in it, but it’ll certainly keep me warm if I need it to. It’s not too much different from what the pattern called for, save with the modification of colors. Beyond that, there, thankfully, wasn’t too much more to plan, so I just got straight to work on making the squares. Since I planned it, I hadn’t gotten as much progress done with the squares as I wanted to. 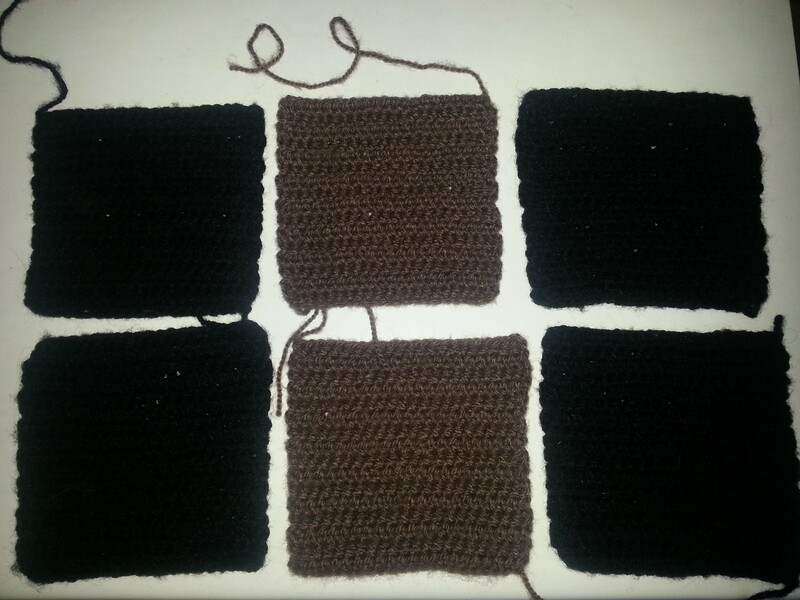 Overall, I’ve only made about six squares and I’m currently working on my seventh square. I apologize for the poor quality. Unfortunately, when I took the picture, the lighting wasn’t behaving with me and black, I’ve learned, is not easy to take pictures with in poor lighting. Even with flash, it still came out oddly. Oh well. That isn’t the order I plan on stitching the squares. I just merely put them that way to show you the progress I’ve done. My game plan is to stitch four squares of each color at a time, so I won’t get too bored just working with one color the entire time, and then stitching them all together when all of my squares are done. I planned on stitching them together whenever the four square batches were done, but I’m not too sure about that method, mostly because I don’t know how to really sew them together without the aid of a sewing machine. If you guys have any tips, please let me know! Overall, this project has been slow going and it still might take me a bit before I’m actually done with the squares. But I can’t wait to get this blanket done. Winter’s already hit here and while it’s not cold as it is up north, it’s cold enough to matter. Have a very Happy Thanksgiving, Guys, and Happy Crafting! So as you’ve noticed, It seems like I’ve died once again, this time for the span of a month or so. I want to first apologize for the spurt, then me suddenly disappearing off the face of the blogging world again. This blog means a bit to me, being that it’s the first actual blog I’ve genuinely shown interest in, and I hate neglecting it and especially neglecting you guys, my followers and the people that read my blog. I feel as if I’ve let you guys down and I really want to apologize for that. Unfortunately, real life and stress got in the way and I had to focus on other things. I’ve neglected a lot of my hobbies during that rather stressful period too. I’ve managed to balance everything out, however, and I can tell you guys that I’ll be around a lot more, doing a lot more blogging and updating my various projects. I would like to do something on this blog besides project updates, however. Something that would be featured here weekly would be nice, but the problem is, is that I don’t exactly know what to do. I have no ideas and I’d love to get your input in this! If you have any idea of what you’d like to see on here beside projects, Please post them in the comments! I read each one and it’s quite possible that I’ll take your idea and use it on this blog each week! At least I haven’t been neglecting my crochet during this hiatus. I’ll give a little blurb about the projects I’ve been working on below, then make a proper post about them within a few days to a week. The last time I left with this project, I had just bought the yarn and was planning on starting it. Since then, sadly, the blanket has not come together, nor has it actually made that much progress. Not as much as I would like it to, anyway. I won’t go into too much details about the process of how I’m making it or how much I’ve actually made, since I want to save that for an actual project post. Rather, I’ll just say that this project hasn’t gotten as far as I’d like it to, but I plan on making much more progress on it soon. Side Project #2: Secret Project! This side project has been going for quite a while, but I just never really blogged about it until now. 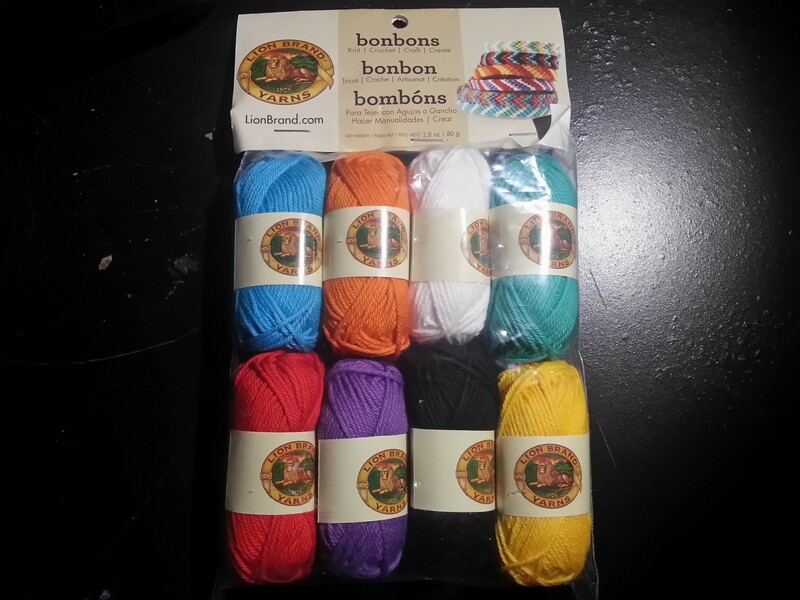 I had bought a skein of yarn that I thought was rather neat (I even put it in a ‘Joann’s Haul’ post!) and wanted to do something with. I had actually started making it while watching video game walkthroughs on Youtube. I prefer to be doing something while watching a video, move or a show because I can’t really stay still and my hands always need to be doing something. This little side project came from that and I’m actually happy to say, it’s gaining some ground! I’ll be sure to post a proper update about it very soon. I think you guys will like it. I believe that’s everything. I’ll be sure to post those two project updates that I promised soon. In the mean time, I really appreciate you guys sticking around and I assure you, there won’t be another sudden absence without proper posting about it first. So this update is coming to you much sooner than I expected it to. As I said in my last post, I estimated that it would take me until Monday or Tuesday to get an update to you. Well, I’m very pleased to report that at least I’m ahead of schedule on that part! I’ve gotten the planning taken care of already, including what pattern I plan on using and what colors I intend on using as well. I suppose that’s really because I’ve been thinking about doing a blanket/Afghan for a while, but I just never really found the time to do it or I simply didn’t have the motivation to start it. Now, however, it’s starting to get a bit colder and I can say that I definitely need a blanket, since the one I have already was taken over by my two cats for their bed. The pattern that I ended up settling for -and what brought my inspiration to do this in the first place- was the Fallen Branch Afghan, a pattern made by Lion Brand. It’s in a block style, where you have to actually sew the pieces together to make a blanket, rather than work it all at once. The picture shows that, once it comes all together, the blanket will look really wonderful, so I’m excited to be using this pattern rather than a standard Chevron stitch. 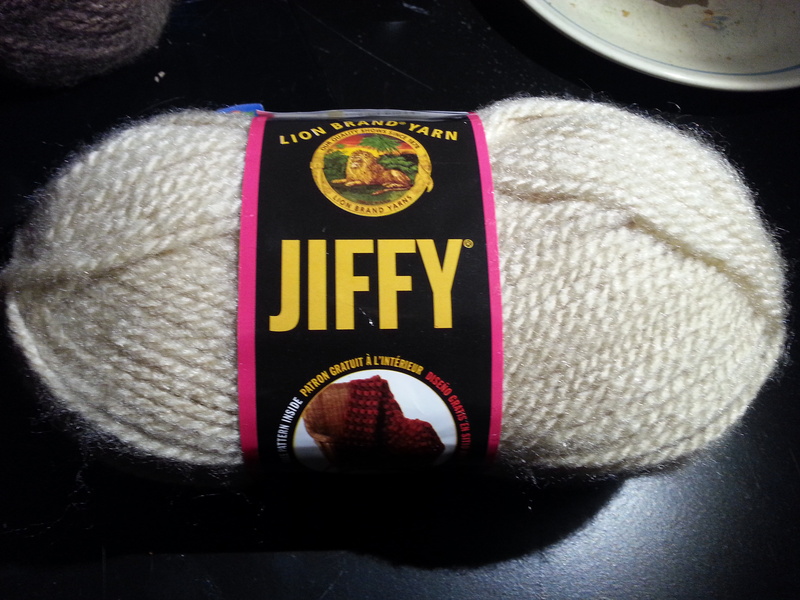 While I am using the same yarn that they call for -Jiffy-, I am using different colors and even one less color than they call for. I’m going for a bit of a dark to light theme with my blanket, so check out the colors I’ve decided on below! As you can see, it’s not as a drastic ‘dark to light’ change as you thought it would be, but I still think the colors will work out well once the Afghan is finally all put together. Also, I know that the pattern calls for four colors, but I feel that, especially with the colors I chose, four colors would just seem like a lot. So I only went with three. Because of this, I had to adjust the pattern to fit my needs, especially the layout. That’s not too big of a deal, though. I plan on putting the rows from side to side instead of up and down, just so it’s a bit easier in the long run. I plan on making ten squares of each colors, which should amount to two skeins of each. If that’s not enough, though, I suppose I’ll just have to buy some more. That won’t be a hindrance at all, considering that all of the colors I got were well stocked at the Joann’s here in town. Otherwise, I should be all set for this project. I believe that’s it for now. I’ll update with how my progress is sometime in the middle of the week. I estimate by Thursday, if everything goes well. So, here’s the big update about all of the projects that I left you all hanging with on my sudden two week hiatus. I’ll not only be talking about them, but I’ll also be talking about projects that I will be or want to be starting in the future. This was a project that I only announced in a previous update. I never quite got around to making a post about them, so when I last posted about them, they were just an inspiration in my head and I had just gotten the yarn with it. Well, I’m partially pleased to say that they’re finished! Only partially because they didn’t turn out the way I wanted them too and I’m not too happy with the way they turned out. Check out some of the pictures below. 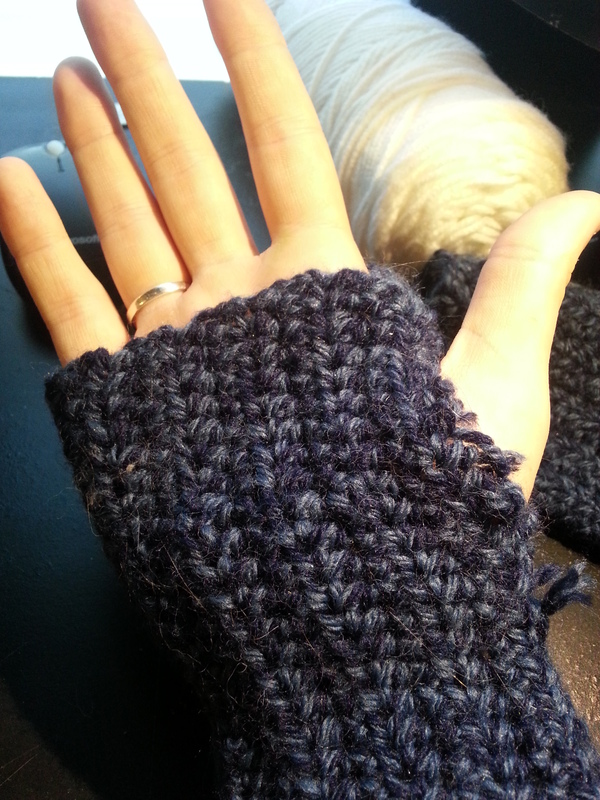 The first batch of pictures is from the first wrist warmer I made. As you can see, the first one didn’t turn out too badly. 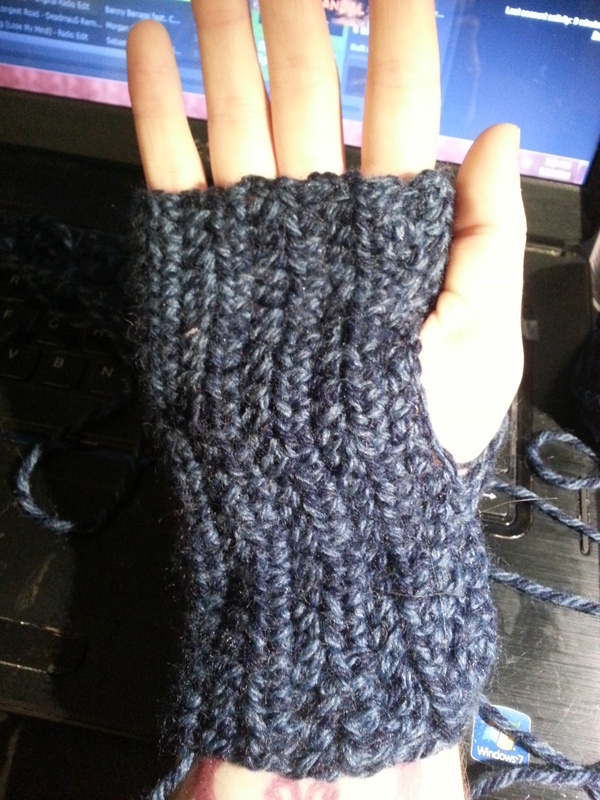 I, once again, overestimated how big my wrist warmer would be, as you can see from the bulkiness across my palm. I also didn’t quite measure out where my thumb would be right, so it’s a bit tight in that area. Overall, It didn’t turn out too bad and it gave me a bit of hope that the project would turn out alright. 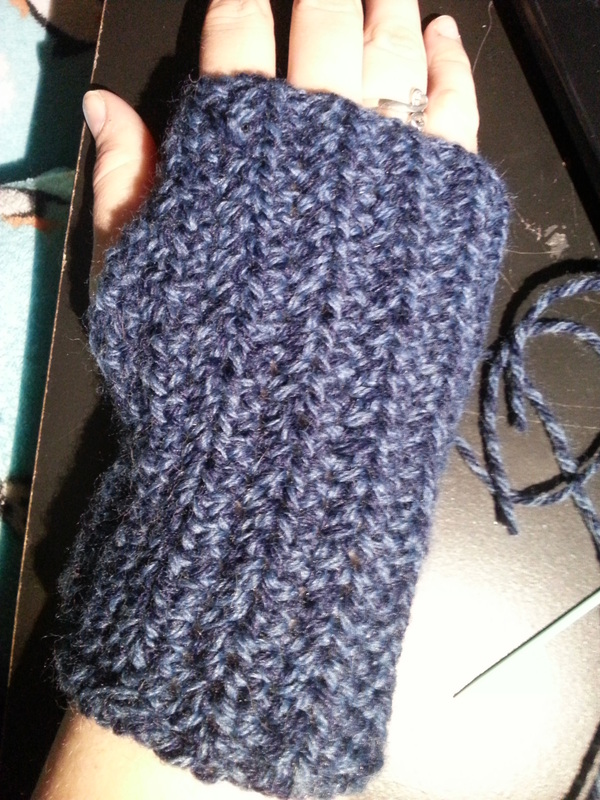 The second batch of pictures is for the second wrist warmer I made. As you can tell, I didn’t do so well on the second one. 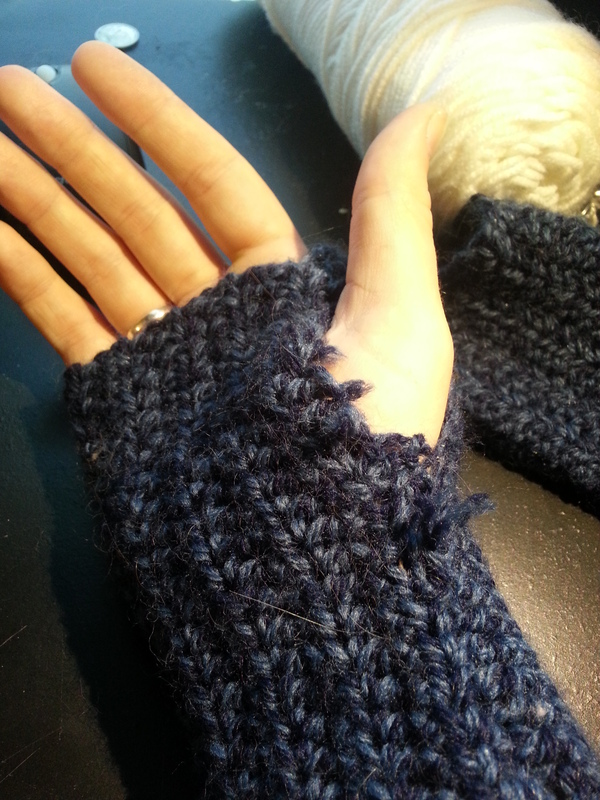 In my haste to get these done, I forgot about the thumb hole -which is a bit of a requirement for wrist warmers- and therefore, had to cut open the seam and resew it again, this time adding a thumb hole, and leaving torn threads stuck into the piece. This one is also a bit bigger than its partner and tends to ride up on my wrist. Overall, not very functionable. 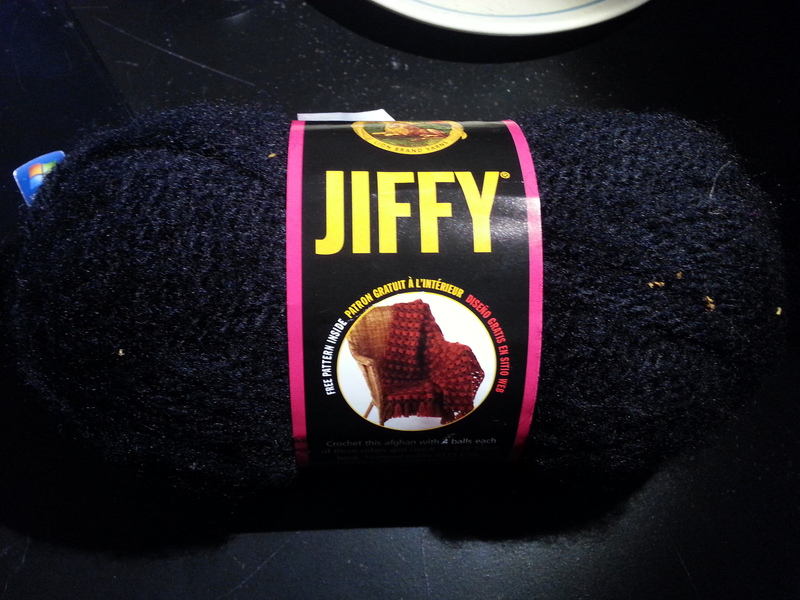 I honestly, have no complaints about the yarn or its quality, though. This was my first time using anything from Lion Brand and I have to say, it will keep you really warm, if you make a scarf or any type of wear from it. 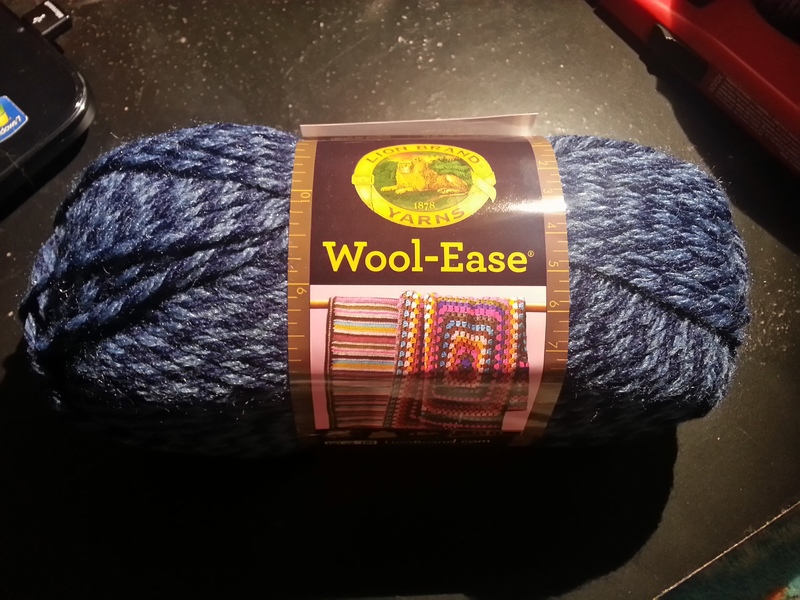 The specific yarn that I used was ‘Lion Brand Wool-Ease’ in Denim twist. The colors were what drew me to it in the first place and it didn’t disappoint me in my expectations. At least that turned out right. Overall, I know that I’ll have to make another warmer to match, but for now, I’m going to mark this project as ‘Complete’ and move on to other things. Well, this was a side project that was originally a main project. You can read the last update about that here. I had already had to change fabric once, mostly because of a screw up on my part about gauge and using the wrong size needle. The most recent pictures are in that link, as well as the last known progress about it. Sadly, this one has no pictures, because I honestly have not done more on it than I should have. I just completely lost inspiration with it, and I think that was mostly because of how weird the pattern was. It was a strange pattern for a beginner like me and I constantly kept getting my sides uneven and it looked NOTHING of how the picture said it should. I think that I’m going to put a hiatus on this side project. I may even scrap this scarf altogether and go for a bit of an easier one. There are plenty more on the website for Christmas at Sea, so there will definitely be another scarf in my side project future. I have at least two projects that I’m really excited to get started on. It’s going to be a short section, but this is merely to inform you guys of what’s going on for the future! The first one is a blanket. I’m still in the planning stages for this one and trying to figure out just what kind of design I want the blanket to be. I already have the colors picked out, however, so trying to finalize a design shouldn’t take too long. I’ll have an official project post about it done either by Monday or Tuesday of this coming week. B. My dad doesn’t get near as cold as I do when it does get cold around here. So a dish towel is the next best gift for him. I’m not too sure if I want to make mini-color blocks or stripe it, but I have plenty of time to think about the design. So there’s no need to worry about that. Whew! That was quite an update. If you managed to stick through that, then thank you! I appreciate it greatly. I should have my next update done by Monday or Tuesday, as I mentioned before. So be on the lookout for that! Quick Update! I’m not dead! I have to apologize first off. It’s been two weeks since I’ve updated this blog and I feel terrible for it. I love this blog and I hate neglecting it. However, Real life got in the way for a while and I have to admit, I lost inspiration after my wrist warmers were finished and didn’t come out the way I wanted them to. I plan on doing one big update, to close off the rest of the projects that I left you guys hanging with. 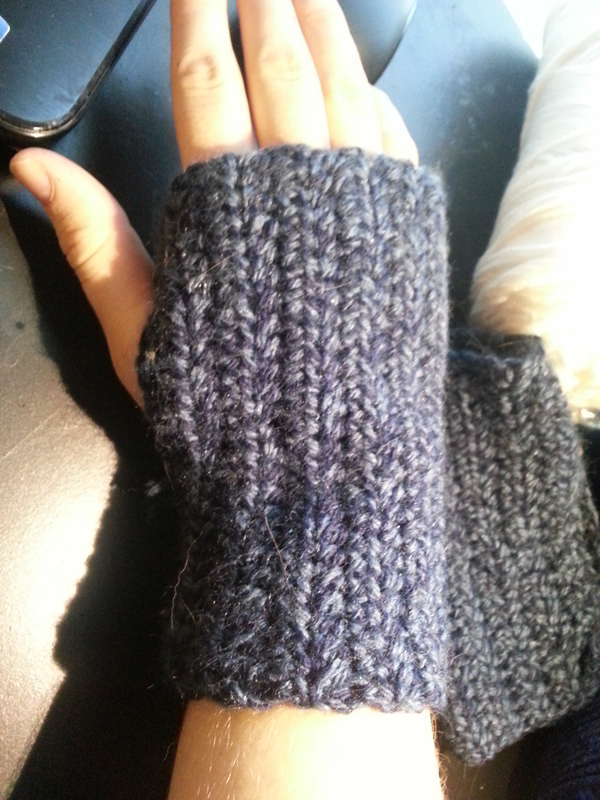 The wrist warmers are finished, but I’m not too happy about them. The scarf is a different story, but I don’t plan on boring you with all of those details right now. No, that’s for the next post. I also plan on informing you guys in another update about projects that I want to get started on. One of them is something I’m a bit excited to do. Like, really excited. I plan on getting that update out to you guys as soon as possible. I just want to say thanks, mostly. Thanks for sticking around these two weeks while I’ve been away and I hope you plan on sticking around. This scarf is turning out to be a bit harder than I imagined. 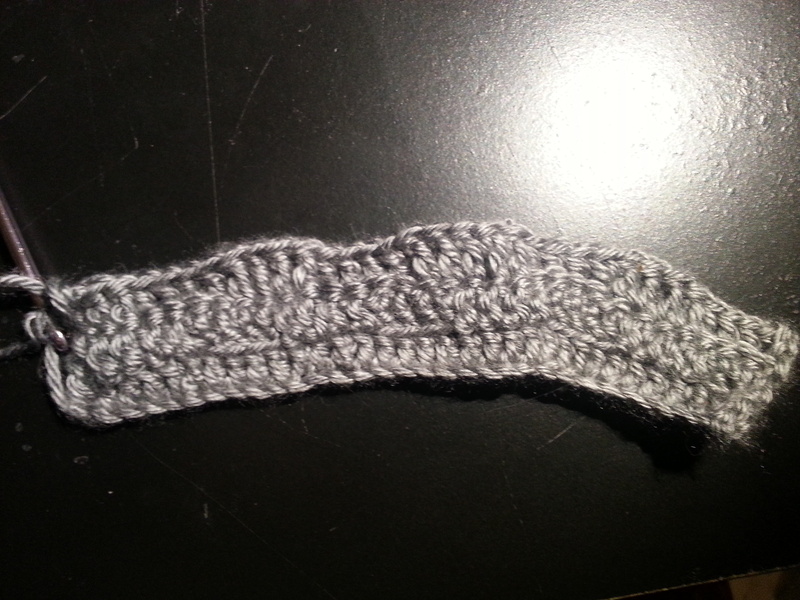 I officially started the scarf the 17th, following the pattern exactly, even using the right hook that it told me to. It’s…not turning out exactly as I thought it would. 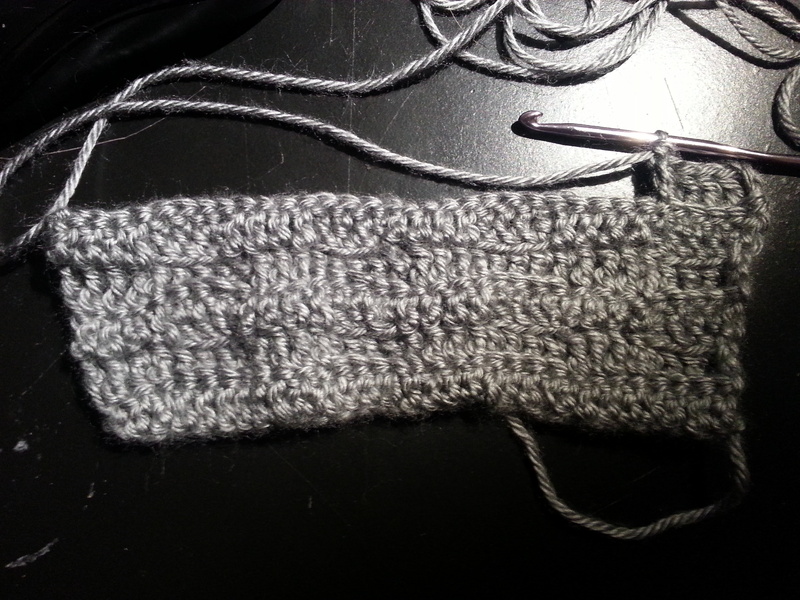 At first, I started using the Caron’s ‘Simply Soft’ in Heather Gray that I’d gotten. It’s the first time I’ve used this brand, so I was a bit nervous at how it’d turn out. I was also still trying to get used to the feel of it, since I’m so used to the rather rough texture of Red Heart. Almost as soon I started the pattern, it already seemed a bit strange to me. Check out the progress picture below. The last picture is where I ended off when I realized that my hook I was using was too small for what the pattern called for. You can see how not only the ends look very uneven, but how the whole pattern seems to wave from side to side. Now, I can imagine that this is from using the back and front loops, switching every four times, but it still doesn’t look quite right to me. I actually ended up starting another one in different yarn after deciding it wasn’t worth the trouble to take it apart and do it in the right gauge. I plan on making a scarf for ‘Christmas at Sea’ in this yarn eventually, though. Mark my words! It’s still turning out wavy and uneven at the sides, which I’m hoping will go away once I start to build my rows. The stitch gauge is right, though, after changing my ‘G’ hook to an ‘H’ hook. A right decision. It looks a lot better now. I honestly don’t know if I’m going to stick with this pattern, though. It seems to be giving me a bit of trouble and I might just use a different one that’s on the website. But for now, I’ll keep trucking along and figuring out just what to do from here. Another ‘Joann’s’ haul and Project change! So I’ve had quite a few developments this week since I last spoke on Tuesday involving projects and another Joann’s buy, this one a lot bigger than my last! I suppose we should get down to business, hm? I’ll get this out of the way first. I’ve decided to change my projects around. My ‘Christmas at Sea’ scarf is proving to be a slight challenge. 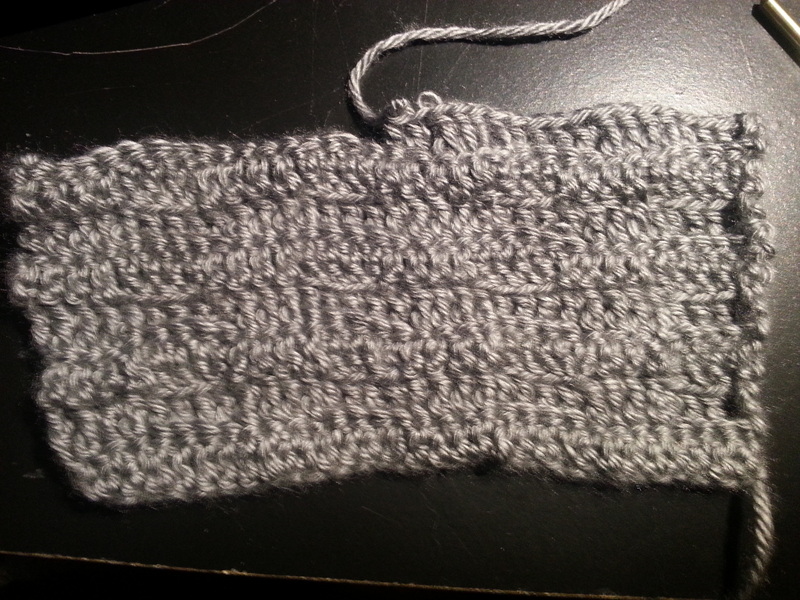 Not for the fact that it’s in Double Crochet -which took me a bit of time to get used to again- but at the pattern. It’s bascially working through the first four back loops, then the next four front loops, and going on until you reach the end. Then you start the entire thing over again on the next row. It’s not difficult, but with the amount of time that I feel like it’ll take to do this scarf, especially since I’ve had to tear the whole thing apart, I’m moving this one to a ‘Side Project’ to work on. I’ll be sure to make an update about it soon! Instead, what will be taking its place is a pair of Wrist Warmers! I found this pattern on Lion Brand’s website. Since I need some gloves to match ‘The Scarf’ and those look pretty quick and easy, I’ll go with those. 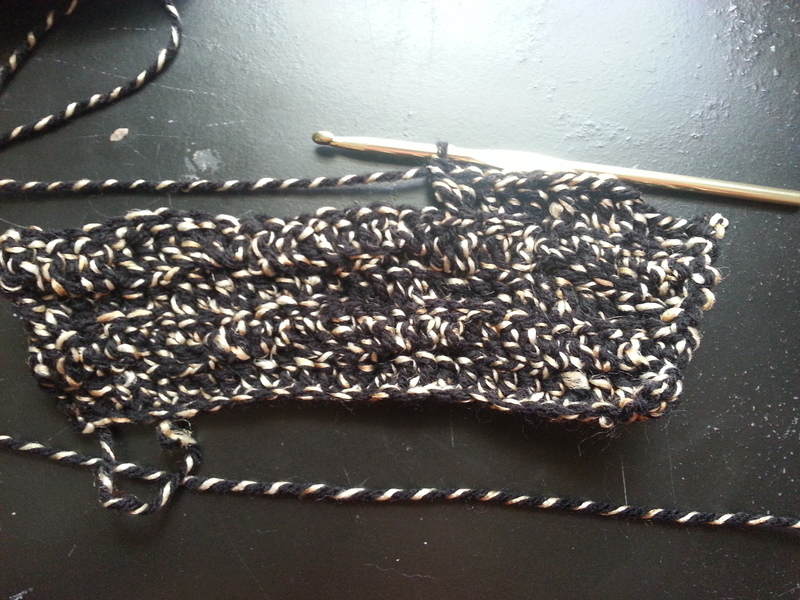 Adapting the pattern to my yarn -I have regular worsted weight and not bulky- won’t be hard at all. I’ll be starting on those tomorrow. So, Remember how I talked about going to a bigger Joann’s in my Monday Update? Well, Yesterday, I finally went into the bigger town to go and oh, I brought back quite a few things with me. Check them out below! I’ve been eyeing these on Lion Brand’s website for a while. They look pretty useful in making small ornaments, little figures, or even just to add small decorations to larger pieces. The possibilities are endless. I mostly have these, really, just to have them. I do have a few ideas with the holidays coming up, so we’ll see what I create with them. I think I have an addiction to this yarn. 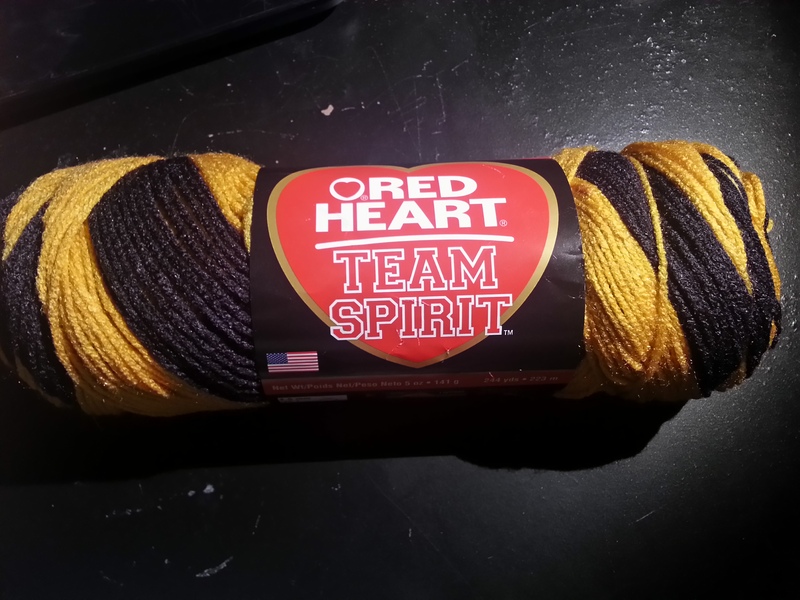 This is another addition to the yarn that I’d gotten on my Monday trip to Joann’s, where I got Team Spirit in Red/Gold and Blue/Gray. I planned on making Hogwarts House scarves with them, and I think I just added another scarf to my ‘To-Do’ list, this time in Hufflepuff colors. The reason for this? Well, even though I was sorted into Ravenclaw (via Pottermore), I always thought I’d be a Hufflepuff. 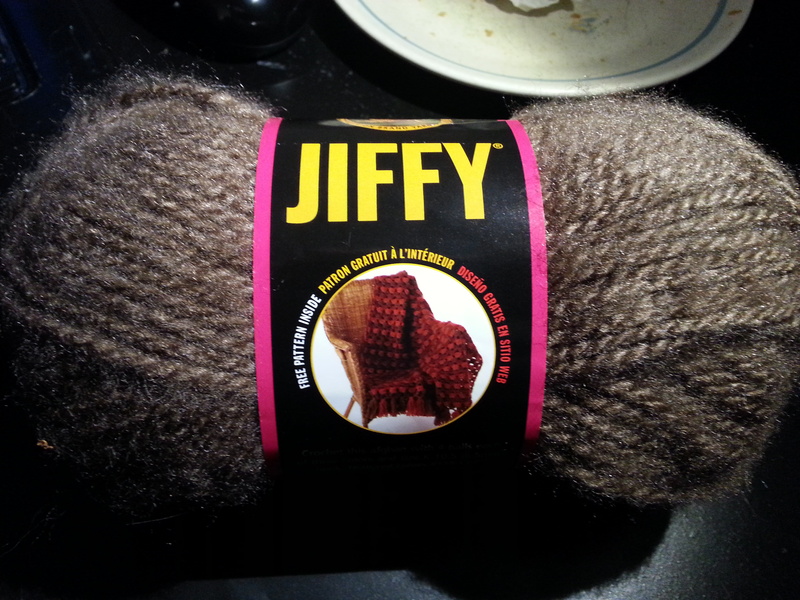 So, when I saw that the yarn was still on sale, I figured ‘why not?’ This’ll be another side project soon enough. As soon as I saw this yarn, I fell in love with it. It’s a very nice blend of dark blue and a lighter blue. It seems really soft (and not overly soft like Caron’s) and seems like it would be durable to make outdoor wear with, like hats and gloves and such. While it’s not a self striping yarn like I really wanted, it’s still perfect for the wrist warmers that I mentioned I was going to make above. I bought two skeins of it, so I shouldn’t have any issue not finishing the warmers. So, I broke down after reading this magazine so much at work and decided to buy it finally, simply just to have it. It was an impulse buy, really. They seem to have a lot of great patterns in here and even have a few articles in here that are really worth reading. I might look into buying an actual subscription to this magazine. 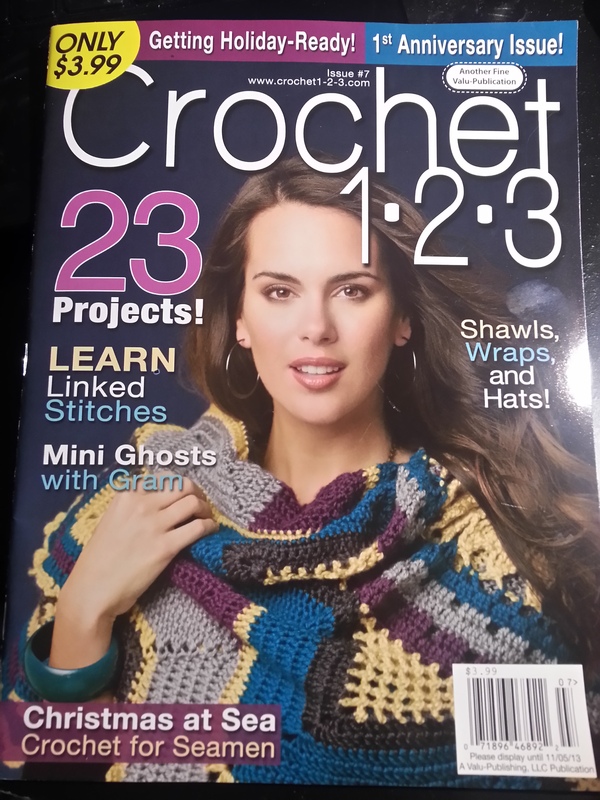 These look like they were made for knitters rather than crocheters. 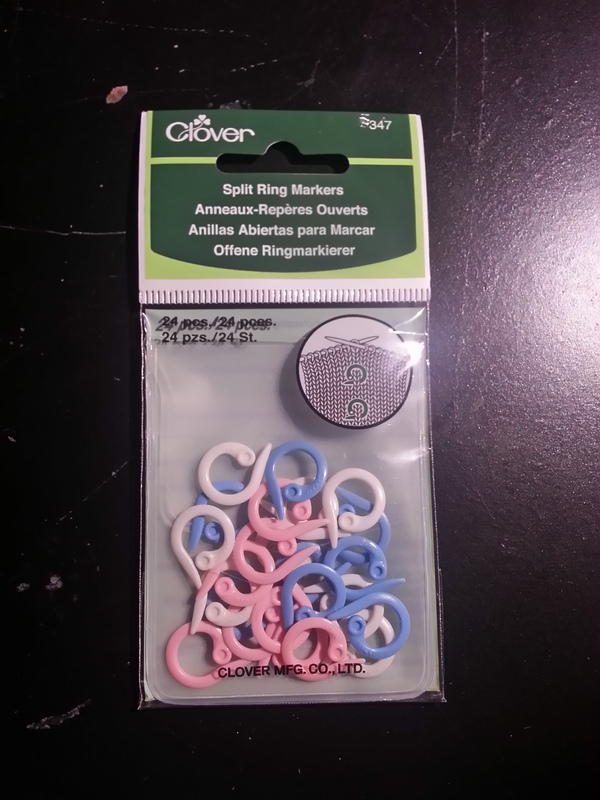 But I need more stitch markers, ones that are actually easy to use instead of me fumbling with the not so great ones that came with my hooks when I bought the little kit. I haven’t used them yet, but they look like they’ll be easy to put in my stitch without fumbling around with the yarn too much. I’ll be sure to update you guys on my side project and new main project very soon. Wynn of All Trades This is my best friend’s BiWeekly challenge blog! She’s the crafter that inspired me and does biweekly challenges, complete with updates and all! Check her out!